6:30pm- We have a lot of snow out there. This storm brought me 7+, but a friend in Athelstane only had 5+. No big deal, we have plenty. When I was plowing the road I was running into the problem with the banks getting too high to throw the stuff over. They are waist high in most places and the piles at the end are 5-6 feet high. A couple of more storms and I am going to have a disposal issue. I am also getting concerned about roofs. The snow is knee deep now. It isn’t a problem yet. I just checked out the forecast models for the pending storm. We are under another winter storm warning. The WSW says 5-11 inches, and snowfall rates of up to 1-2″ per hour tomorrow afternoon. My guidance totally agrees, and agrees with the 12am Thursday to 12am Friday time frame. The trails that I saw were a little loose with the new snow. When the groomers make another pass on it they will be fine. They are not short on snow and tomorrow will add to the bounty. The weekend looks cold but clear. There are some events to talk about tomorrow too. 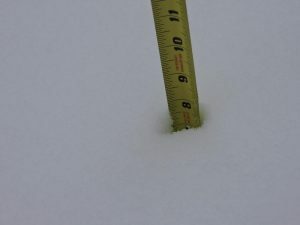 10:30am- I consistently measured 7.5 and a couple of places were 8″. It is kind of puffy and will settle. But for now.. 7.5-8″. 9:53am As expected we saw 1-2″ of additional snow since my 9pm update. I have not been out to measure it yet. Looking out the window my boot tracks from the 9pm measurement were filled a little but not gone. My guess right now is about 7-8″. I am headed out to clear the driveway in a little while, I will update afterward.